X60 wipers feature Hydroknit technology that absorbs more than two times as much water as rags for versatile cleaning performance. They don't use adhesives or binders so they'll leave no residue behind, and they're reinforced for strength when wet or dry. 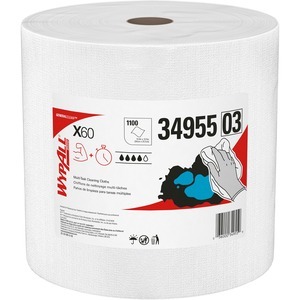 Jumbo rolls provide the larger sheet size and high count required by industrial professionals. General-purpose wipes are perfect for applying thinners and solvents, cable lubricant removal, adhesive cleaning and more.